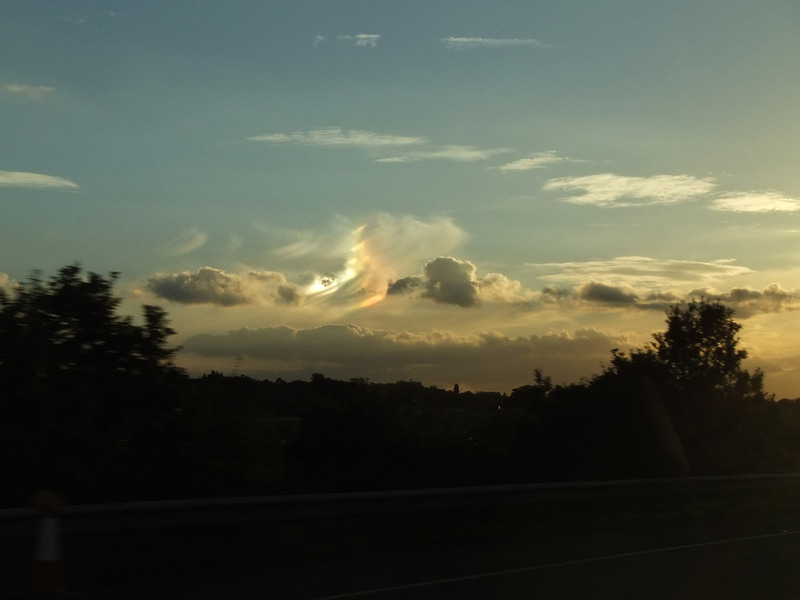 The stereo pair above showing a scintillating sundog (left parhelion) was captured near Guildford, U.K. in the late afternoon of September 25, 2010. The two photos comprising the pair were taken about 20 seconds apart in order to get the desired separation. Can you see the 3-D effect? This particular sundog was quite conspicuous, especially the bright white “tail,” which is on the outside of the sundog – points away from the Sun. Sundogs form in plate-shaped ice crystals having a preferred orientation. Light enters one of the crystals’ side faces and exits through an alternate side face, being bent 22 degrees in the process. Thus, they’re found 22 degrees on either side of the Sun and at the same solar altitude. If the crystals are not all aligned similarly, as was the case this afternoon, parhelia will develop vertically, along the arc of the 22 degree halo. Photo details: Camera Maker: FUJIFILM; Camera Model: FinePix REAL 3D W1; Focal Length: 10.3mm; Aperture: f/8.0; Exposure Time: 0.0050 s (1/200); ISO equiv: 100; Exposure Bias: none; Metering Mode: Matrix; Exposure: program (Auto); White Balance: Auto; Light Source: Unknown; Flash Fired: No (Auto); Color Space: sRGB.